Using username "username,projectname". Authenticating with public key "username,projectname@shell.sourceforge.net" from agent Requesting a new shell for "username" and waiting for it to start. creating... starting... This is an interactive shell created for user xuehaiyisu,imybbs. Use the "timeleft" command to see how much time remains before shutdown. Use the "shutdown" command to destroy the shell before the time limit. For path information and login help, type "sf-help". Requesting a new shell for "username" and waiting for it to start. 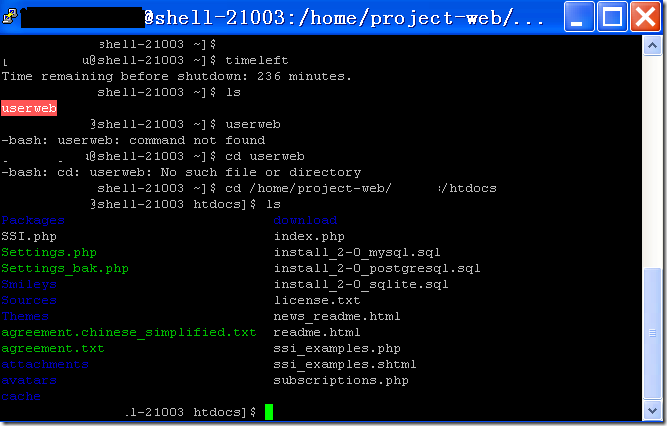 This is an interactive shell created for user xuehaiyisu,imybbs. Use the "timeleft" command to see how much time remains before shutdown. Use the "shutdown" command to destroy the shell before the time limit. For path information and login help, type "sf-help". This entry was posted in Other and tagged PuTTY, Sourceforge by annhe. Bookmark the permalink.